This trailer has a problem. It may look fine. It may look like it works. So what’s the problem? That’s what has been happening to us. When we got the trailer it didn’t come with the connector part that mounts the trailer on the bike. I didn’t think much of it. I looked up the owner’s manual that came with the trailer and the price to order it was $6.99 plus $3 shipping (to the US and Canada). I had the part number, the cost and shipping to Canada seemed reasonable! So I called the customer service line on the owner’s manual and the lady that answered started me on a month long quest that hasn’t ended. She told me that they didn’t ship to Canada. I told her that the owner’s manual specifically stated shipped to Canada on it. She said that wasn’t the case, and gave me the phone # for Dorel, ‘their parent company’. I’ve learned that ‘Parent Company’ means no accountability in corporate speak. Dorel told me that they didn’t deal with customers, and that I was calling their corporate headquarters and they weren’t able to get me the part. Dorel is a CANADIAN company headquartered in Quebec! Here is Dorel’s vision…”Our vision is to create the most innovative and admired company in the recreation and leisure marketplace, and to become a global leader, which is why the Dorel segment was established in the first place.” Admired? By who? The corporate headquarters gave me a different US phone number to call. I called this new number and they proceeded to tell me that Dorel wouldn’t let them sell the part to me in Canada due to some trade agreement. ??? WTF? Aren’t you the same company? Yes. The same company with parts spread all over the damn place. My wife went on their Facebook page to tell our dilemma with getting this $6.99 part. A nice lady that moderates their Facebook page emailed me directly to tell me she would help. She gave me the same phone number in the US that I got a month ago. I have made at least a dozen calls to who knows where and the summer is coming to a close. No trailer part. I finally saw a small light at the end of the tunnel, when a ‘Customer Relations Specialist” emailed me yesterday to say she could help. I stressed that I was a Canadian and hoped that wouldn’t confuse matters and make them think I was looking for a dog sled or snow shovel. 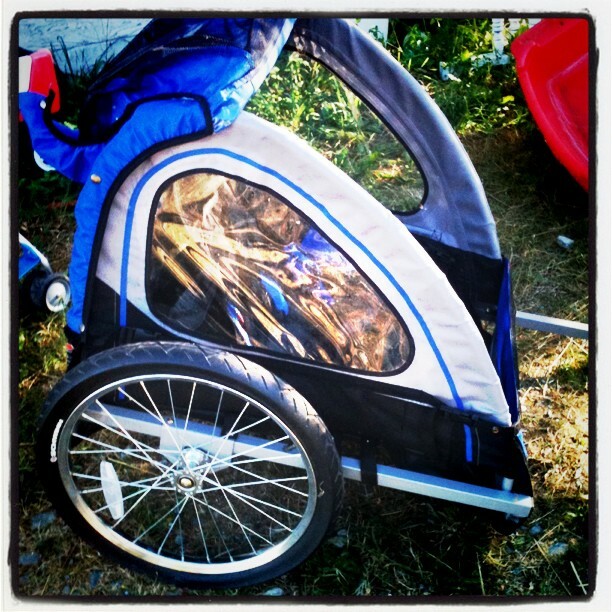 Oh, and NEVER, EVER buy a Schwinn trailer. Previous PostPrevious My Moleskine – Remember the Milk System. Old vs New.